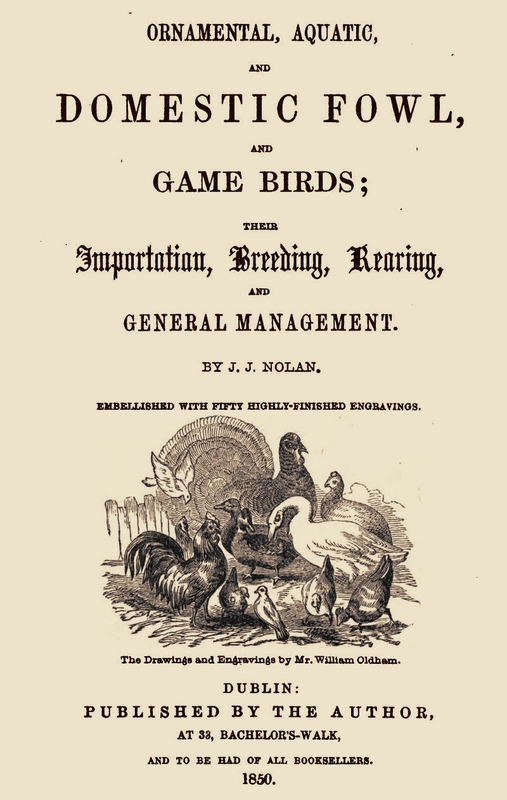 Published in 1850, J J Nolan’s work was aimed at those who showed poultry which was very popular amongst the landed gentry and those who aspired to emulate them. 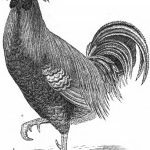 … and having been encouraged, by the approbation of the London Zoological Society, who have awarded me many premiums, in competition with all England, Ireland, and Scotland amd been most successful, at all the Poultry Shows, in Ireland, at which I have exhibited, I beg leave to give the public the advantage of my practical experience. Apart from the pictures and articles on the various birds, what I find most interesting in the work is his political attitude. He had that Victorian zeal for philanthropy and obviously felt it was the responsibility of the wealthy landowners to assist their poor tenants to help themselves, if only so they can pay their rent and further enrich the aristocracy. To put it into further context, the book was published in 1850 when Ireland was in the fifth year of the Irish Potato Famine. Half starved tenants were being forced onto the road by the landlord’s bailiffs and those who could muster the passage were emigrating to America. 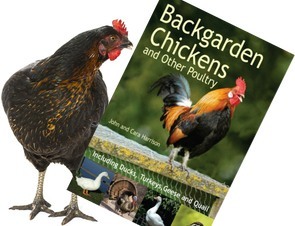 The Importance of Breeding and Rearing Domestic Fowl has not been sufficiently appreciated. France, Germany, and the Netherlands were, and still are in the habit of supplying the English market. 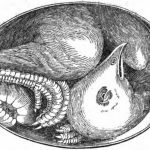 Latterly, the value of the eggs and fowl, sent from Ireland to England, has amounted to more than a million of money, annually; and being kept at home, is a material object, as it is, in a great measure, produced without outlay or expense. With attention and encouragement, it might be made to treble that amount, and would, therefore, afford additional comfort and emolument to the cottager and farmer. If the thing be encouraged by the landlord, he will ultimately benefit himself, as it will assist the tenant, in the way of meeting his engagements. 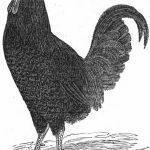 Poultry clubs are established in most of the principal towns of England and Scotland, for the encouragement of the best breeds; and why not the poultry fanciers, of Dublin, meet and establish a similar society here, Ireland being a much more poultry country than either of the other two? Everything here connected with agriculture should be encouraged—it is quite conclusive that we have no chance of manufactures; so that every thing connected with the farming interest, needs our utmost support. If such societies were commenced, with periodical shows, under the auspices of respectable, competent, and uninterested judges, the thing could be made most valuable. The fanciers would have a knowledge of where good fowl were to be had, and the trash that has latterly been exhibited, would be excluded. Such societies, respectably got up, and fairly carried out, would be of immense utility; they are in every town of note in England. Our abundant potato crop, of former years, caused an accumulation of fowl and since the blight, it has been discovered that there is no substitute for it as a feeder of pigs or poultry, the small, or refuse, with the insectivorous and vegetable matter found along the ditches and hedges, with dropped corn and grass seeds, affording an abundant supply; and where there is a convenience to keep waterfowl, the aquatic plants, and coarse grasses, rejected by other animals are their favourite food, and consequently they are produced at the least possible expense. 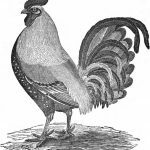 If the gentry would procure some fine specimens of Cochin China, Malay, Chittagong, Spanish, or Dorking, and give, or exchange their eggs, with their tenants, they would do an infinity of service. 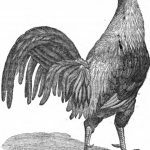 My much regretted friend, the late William Beilly, Esq., of Belmont, Mullingar, was one of the first, of the gentry, I had the honour of supplying with fine poultry, and never was the thing turned to better account. 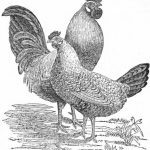 If any of his tenants brought a clutch of common eggs, into his farm-yard, they had, in exchange, for them, some of the finest Dorking, Spanish, or Aylesbury duck’s eggs, and those poor people realized as many shillings for their fowl, as they had before sold them for pence.